The latest data from market research firm Strategy Analytics claims Android captured a record 87.5% share of the worldwide smartphone market in the third quarter, reflecting the period between late June and late September. Android's leadership of the global smartphone market looks unassailable at the moment. Its low-cost services and user-friendly software remain attractive to hardware makers, operators and consumers worldwide. However, several challenges remain for Google. The Android platform is getting overcrowded with hundreds of manufacturers, few Android device vendors make profits, and Google's new Pixel range is attacking its own hardware partners that made Android popular in the first place. While most of Android's gains can be attributed to the continued demise of BlackBerry and Windows smartphones, which are now practically non-existent on the market, iOS adoption remains at its lowest levels since mid 2014.
iOS recorded 12.1% market share in the quarter, down slightly from 13.6% in the year-ago quarter, allegedly due to a lackluster performance in China and Africa. 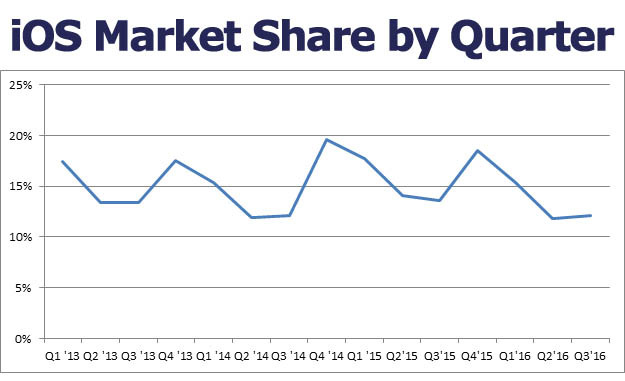 That nearly mirrors the platform's 12.2% market share in Q3 2014.
iOS and Android together account for 99.6% market share in what has become a two-horse race over the past several years. Windows Phone is virtually dead, and BlackBerry recently said it is done designing its own smartphones. Basically an irrelevant number. As smartphones penetrate India, Africa, and other countries with extremely large no-income populations, the only factor is cost. That's not a "market". Android phones get dumped there in large quantities with low quality. A more relevant number is a country by country marketshare. Though, even that is easily misinterpreted. I think it's a clear sign that they need to make the iPhone thinner by removing all ports and the screen. Most of the world is poor, so this makes sense. Apple never tried to be the most accessible by price. I switched to Android in 2011. This year, I thought I'd give iOS a go and bought an iPhone 7. After five weeks, I've switched back. iPhones are great phones, but the software is frustrating, awkward and unintuitive. Apple really are being left behind - they're not listening to their consumers (or, at least, the ones who are leaving) whereas Android are.. Funny, I think the same thing when I use my Android devices. Seems more like what you're used to than anything else. iPhones are great phones, but the software is frustrating, awkward and unintuitive. Apple really are being left behind - they're not listening to their consumers (or, at least, the ones who are leaving) whereas Android are. In other news, Android profitability remains at an all time zero with so many OEMS being suckered into a vision of bankruptcy with only Google to gain from it all. But Android is listening to their consumer? Are you sure we are on the same page here? Google is unarguably the worst when it comes to listening to their customer on Android. It's literally a platform for them for data gathering + ads. Nothing more. If they truly do listen, android will be closer to iOS than ever before. I use both iOS and Android. I used to use mostly iOS until Android 5 and since then I have started using Androids as my daily drivers. Android used to be ugly, copying iOS but with all the problems of Windows Mobile 6. For the last few years, iOS has been playing catch up to Android (stuff like multi-tasking, widgets, even folders, if I remember), but Android is pulling ahead, rather steadily. I think the differences are still not major, but I do find iOS less user-friendly and clunkier that Android 6 and more so than Android 7. Overall, Apple has been disappointing both in terms of OS and somewhat in terms of hardware. And to all the smug "it's because they are poor" replies above, get your nose out in the real world. 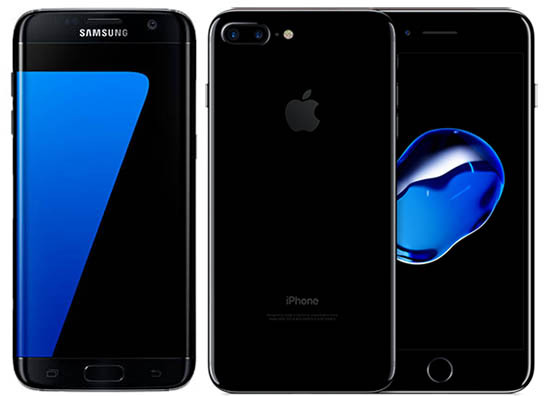 The Galaxy S7, which is soon to be replaced by a new and supposedly much improved model, still manages to beat the newest iPhone's camera, which is the biggest smart phone differentiator for many consumers. Moreover, there are a number of Chinese companies which have entered the market with $600+ devices, some of which are arguably equal to the iPhone 7, and just slightly cheaper. So yes, while the emerging markets may be poorer than the US, their population is much larger, overall. Apple has dropped the ball, both with Mac OS and iOS, and to a large extent with hardware, and I personally don't see anything in the pipeline which will change this. After five weeks, I've switched back. iPhones are great phones, but the software is frustrating, awkward and unintuitive. Apple really are being left behind - they're not listening to their consumers (or, at least, the ones who are leaving) whereas Android are. Most annoyingly, I'm just outside the returns period for my iPhone. With saturated phone markets I don't understand Apples hesitation to create a lower priced, but quality phone. Don't just offer last year's phone for cheap, actually produce an entry level phone for the ecosystem. Every luxury automaker does the same without diluting their brand. Do they? I've been to third world countries. I must've missed all the "lower priced" Range Rovers and Bentleys. We only barely stuck with iPhone this year when we bought an SE, until then Apple did not even make a phone we were interested in. But a phone is a phone. With Apple not caring any more about my professional computer needs I see no reason to care about the iPhone. Yep it is a great device, but I won't be in two different ecosystems. No Apple computer, no Apple iPhone. This is the first time in my history that I am not recommending Apple products to family and friends. Fanboy status shrugged off.